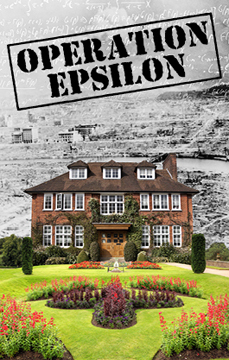 Of Alan Brody's "Operation Epsilon"
The Nora Theatre Company will present the World Premiere of Alan Brody's "Operation Epsilon" at Central Square Theatre in Cambridge from March 7 - April 28. Directed by Andy Sandberg, the company will include Barlow Adamson, Diego Arciniegas, Ken Baltin, Owen Doyle, Kendall Hodder, John Kooi, Will Lyman, Ross MacDonald, Allan Mayo and Dan Whelton. Based on actual transcripts of secretly recorded conversations, the play illuminates the ethical complexity of pursuing scientific discovery at the risk of wreaking catastrophic consequences. Alan Brody is Professor of Theater Arts at MIT, where he served as Associate Provost for the Arts for ten years. His plays have won numerous awards and had productions at such theaters as The Aspen Playwrights Conference, Missouri Repertory Theatre, The Live Oak Theater in Austin, Texas, The Berkshire Theater Festival and The Walnut Street Theatre in Philadelphia. His previous work include "The Housewives of Mannheim" (59E59 Theatres in NYC; NJ Repertory Theatre), "Five Scenes from Life," "Greytop in Love," "One-on-One" and "Reckoning Time: A Song of Walt Whitman." His play, "Invention for Fathers and Sons," was awarded the first annual Rosenthal Award at the Cincinnati Playhouse in the Park in 1989. He also received the 1990 Eisner Award from the Streisand Center for Jewish Culture in Los Angeles for "Company of Angels," which had its world premiere at New Repertory Theater in 1993. Mr. Brody is co-director of Catalyst Collaborative@MIT, a science-theater collaboration between Central Square Theater and MIT. For information and tickets, stop by the box office at 450 Massachusetts Avenue, call 866-811-4111 or visit www.centralsquaretheater.org.